When politicians, pundits, and the media talk politics, they use a lot of words, often as a signal or code to something more complex. In the United States, the word “liberal”, largely tarnished during the Reagan years, has been replaced by progressive to describe policies, partisans, and politicians on the left side of the political spectrum. In Canada, political words are inflected into the brands and names of our largest political parties. 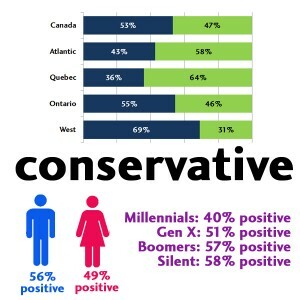 Ever wonder why we rarely hear Conservatives in Canada positioning themselves as the defenders of capitalism? Or why New Democrats prefer to discuss social democracy as opposed to socialism? The results of a little test we conducted in our last national survey offer some answers to these questions. In our latest national survey we asked Canadians whether a set of words elicited positive or negative reactions when they read or see them. The respondents were show a word, in a random order, and asked to select either “positive” or “negative” as how they would describe them. What we we found is quite interesting and is an interesting exercise in political communication and imagery. The info graphics below report the results for each of the five words we tested. 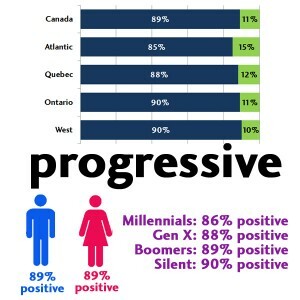 Overall, there was more consensus around the word “progressive” with almost nine in ten respondents saying they have a positive reaction when they see the word. “Social Democracy” also performed well. There was less consensus on the remaining three words. 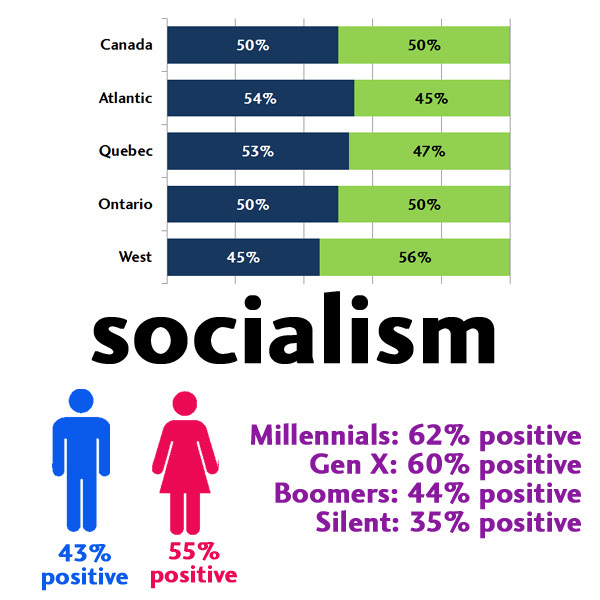 Not surprisingly, the words “conservative” and “socialism” divided the country with older Canadians, those living in Western Canada, and men being more likely to respond positively to “conservative” and younger Canadians and women being more likely to respond to the word “socialism”. 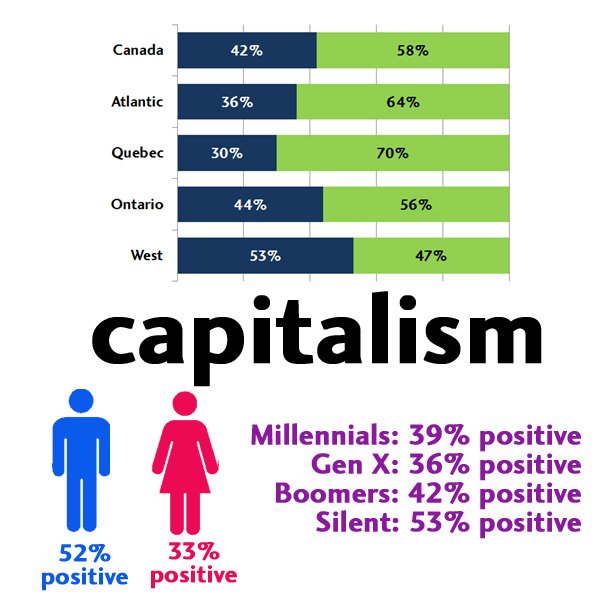 The only word we tested where a majority of respondents reacted negatively to it was “capitalism” with only 42% saying they had a positive reaction to the word. 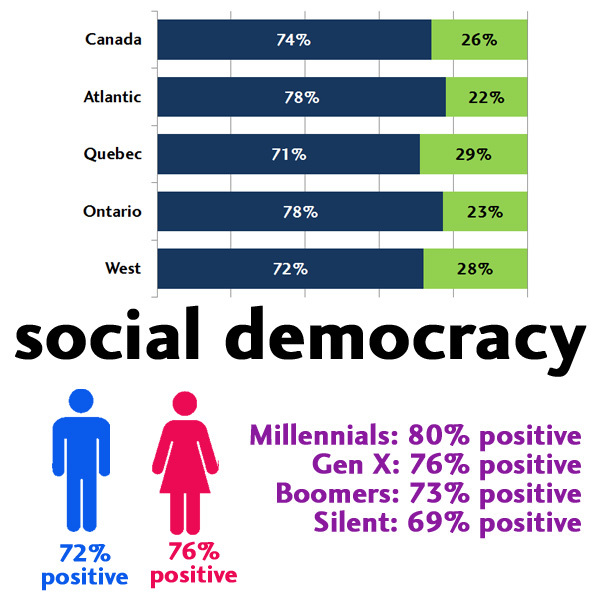 Women, Quebec respondents, and younger generations reacted less positively to “capitalism”. So what’s the point? The point is that the words we use matter. Progressive is a universal word not necessarily associated with one political position or ideology. Almost all Canadians considered it to be a positive word. 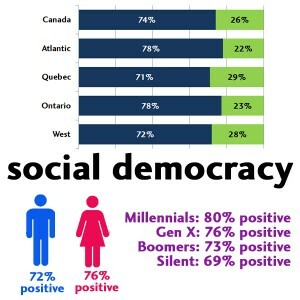 Moreover, despite its connection with left-wing politics, the phrase “social democracy” also is positively received, especially among younger generations. 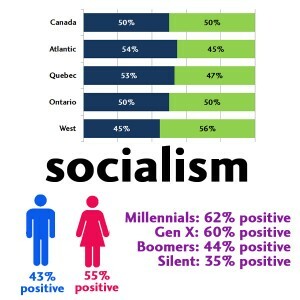 Socialism turns off about half of the country while conservative turns off about the other half. Capitalism appeals to men far more than women and is rejected by over six in ten Canadian Millennials.